For all the coffee drinkers and aficionados who despise the long café lines, dread the overwhelming coffee options or need a fix for those early morning caffeine pains - fear no more! 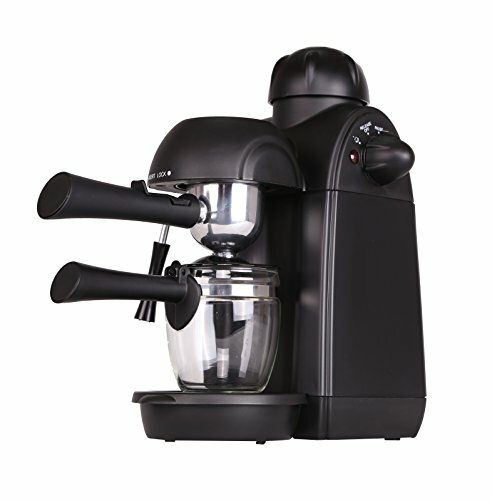 You can now brew a vast variety of hot coffee and tea beverages with the press of a button. ♨• Single switch knob with indicator light for easy operation;4 cups stainless steel filter,aluminum alloy filter holder; boiler cap with built-in valve release pressure automatically. Removable and washable filter for easy cleaning. ♨• Proper 3.5 bar steam pressure of this coffee espresso machine could separate out 4 cup espresso (240ml) rich and smooth crema for your espresso. Uses ground coffee, unique scoop measures and filters ground coffee for the perfect cup every time. ♨• This amazingly versatile appliance allows you to brew coffee, espresso, or tea leaves.Saving you time and simplifying your morning routine.